Apple's iPhone 7 and iPhone 7 Plus will be manufactured without a 3.5mm headphone jack, leading to speculation about the accessories that will be included alongside the two devices. 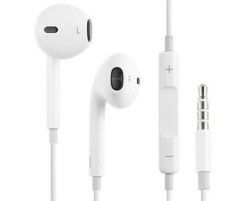 Lightning-equipped EarPods and wireless EarPods are two rumors that have been bandied about, but a new report from Japanese site Mac Otakara suggests Apple may ship the iPhone 7 with standard 3.5mm headphones and a 3.5mm jack to Lightning adapter to allow them to connect to the new devices. Mac Otakara's information comes from sources at Computex Taipei 2016 and the reliability of those sources cannot be confirmed. Shipping EarPods with a 3.5mm jack included seems like an unusual choice for Apple, even if an adapter is included in the box. At Computex Taipei 2016, many manufacturers showcased their new Lightning audio adaptors, and it seems there has been rumors that the headphones to be included with the new iPhone 7 series will still come with its own headphone jack as usual, and that a Lightning headphone jack adaptor will also be included in the package. Past rumors, including one from Mac Otakara itself, have suggested Apple will introduce a new EarPods design that connects to the iPhone via Lightning or Bluetooth, something that would better ease the transition away from the 3.5mm jack than an adapter. We've only heard a few rumors about the EarPods, though, so Apple's exact plans remain unclear. Mac Otakara's report also reiterates claims 256GB of storage will be an option and suggests the iPhone 7 will feature speaker holes on both the right and left sides of the Lightning port, filling the space left by the headphone jack. Rather than introducing stereo sound, the site believes the two speakers will be "on a monaural system." Rumors about the fate of the space left by the removal of the headphone jack have been mixed. Early rumors pointed towards two speakers for stereo sound, but later rumors and design schematics have cast some doubt on whether the iPhone 7 will feature dual speakers. A lot of the information we're hearing about the iPhone 7 is mixed, making it difficult to narrow down the exact features we can expect to see, but the removal of the headphone jack is one of the most consistent rumors we've seen about the device. Other expected features include an iPhone 6s-style design with relocated antenna bands, faster LTE and Wi-Fi, a more water resistant casing, and dual cameras for the larger iPhone 7 Plus. Traditionally, when Apple leans into adopting or killing tech, it leans into it hard. It's historically taken a hard-line approach to eliminating what it thinks are outdated features. Either you adapt to Apple's new standard or you find yourself a new device. If Apple does eliminate the 3.5mm jack, I cannot imagine the iPhone 7 shipping with an adapter. I would anticipate that Apple would instead ship lightning earbuds. If you want an adapter, you pay for an adapter. That's how Apple has done things for just about its entire history and I can't imagine them doing anything different this time around. Who needs headphones that plug straight in? When you can put a dongle in between! Who doesn't want more junk to carry? If dongles were people, they're the kind I'd marry! Instances of dongle-dongle dongley fun! To me this is really simple: no headphone socket means no purchase of an iPhone. The headphone socket is an absolutely essential port for me and its absence is a deal breaker. I don't care if it comes with an adapter or not, or even if it comes with Lightening port headphones; I'm not interested in what amounts to a gimped phone. They'll probably launch as a new accessory that we can pay extra for. If a headphone jack doesn't exist on an iPhone 7, Apple won't ship headphones with that type of connection. That makes no sense. This has to be false. thats an awful user experience. At least ship with headphones with a lightning adapter. This elimination of 3.5 inch headphone jack if true is the WORST stupid idea ever. there is zero benefit,or maybe just doing radial changes no matter what means innovation now? this and the supid 2 lens camera concept..laughable stupid ideas..